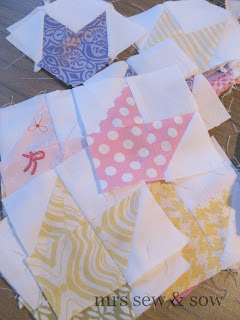 I have found another block I can make with a charm square and I confess a little bit of trimming! 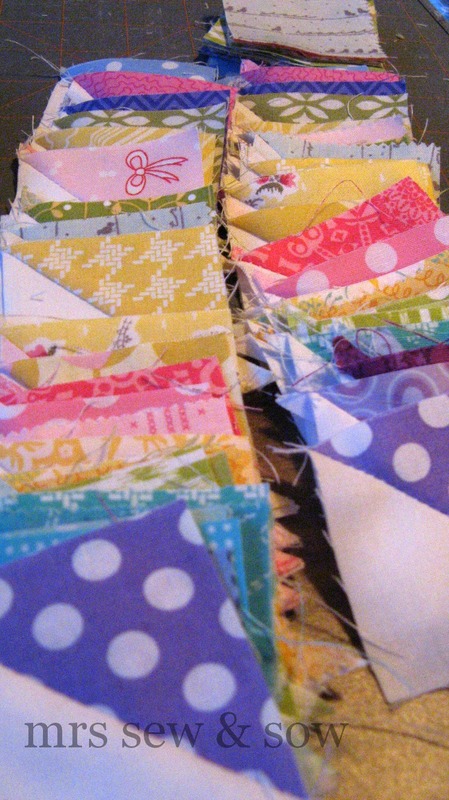 Make four in different prints - I've chosen purple,yellow, green, blue and pink for a bit of a Spring feeling. Add a bit of sashing in white with a central square and you get a block called butterfly at the crossroads among other names! And a quilt like this! Not sure if I'll follow this layout but I'm definitely loving the spring colours! What are you on right now? - please can I have some! Lol, just how many charm swaps have you been in?! Great design- two designs in one, actually! You are on a roll, aren't you! That is going to be a lot of trimming! It's a going to be worth it though! Love this! Go you tackling some HSTs! I love it! I do think you've caught a spring HST bug though - do pass it on, won't you?! You have definitely got a thing with those triangles, Nicky! Love the colours, shame the weather isn't Spring like to match. Ok, I'm going in for the rummage! I may be some time! What a beautiful spring project!